(Nanowerk News) Scientists from the London Centre for Nanotechnology (LCN), Imperial College London and the University of Buenos Aires have published the results of a study testing a silicon nano-device in the journal Nature Communications ("Non-plasmonic nanoantennas for surface enhanced spectroscopies with ultra-low heat conversion"). This silicon nano-device can funnel laser light to a tightly focused spot and probe biological molecules to explore their potential use as new drugs. 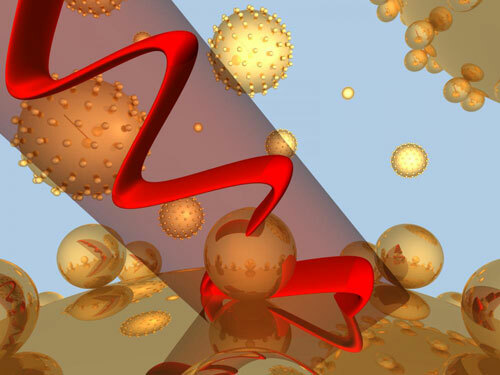 The device has the potential to replace gold nano-devices used in current analytical techniques, where the metal elements can become heated to temperatures of 120 degrees celsius. This quickly damages delicate biological samples and potentially melts the equipment. The innovation is expected to expand the ability of researchers to investigate potential new drugs more rapidly and accurately, and safely at normal room temperatures. Future equipment based on the silicon devices could also be designed for a variety of uses, including investigating individual biochemical reactions and detecting molecules such as contaminants or explosives at extremely low concentrations. Plasmonic nanoantennas with molecules placed into electromagnetic hot spots for enhanced biological sensing. Some materials, such as gold and silver, are used in laser light devices because they have the ability to capture individual photons of light. When fashioned into certain shapes, with specifically patterned surfaces, they can channel photons along their surface, focusing their energy into a tight spot. When the material is a metal, that spot also becomes very hot. The scientists have shown that the same effect can be achieved using their new silicon device, without the associated temperature increase and its unfortunate consequences. The concept of channelling and controlling light in this way also could lead to improvement in the efficiency of solar energy cells, or the development of silicon computing chips that process data communicated by photons of light instead of electricity. Common laboratory analytical techniques such as Raman and fluorescence spectroscopy determine the properties of biological molecules, by making use of the effects of tightly focussed light. "Information built up from the way focused light scatters off a complex molecule can be used to determine something about its composition and structure," said Dr Emiliano Cortes, from the Department of Physics at Imperial College London, one of the authors of the study. "Amongst other things, this information can help to predict how the molecules might interact with biochemical processes in living cells, and therefore their potential as new drugs." However the characteristics of metals that make them good at conducting electricity also lead to the undesirable heating effect, which can introduce inaccuracies in the results even with small increases in temperature. "Gold and silver have been commonly used because they are relatively cheap and easy to fashion into the right shapes needed to channel photons the right way. They also conduct electricity well, so can also pass electronic information back to the equipment." The cloud of free-moving electrons around a metal that carries an electrical current can also absorb passing photons. Each time this happens, a tiny amount of heat is created, which accumulates over time as the device is being used. The scientists experimented with silicon structures used in computer chips that power computers, tablets and mobile phones, which can conduct electricity but their electrons absorb fewer passing photons. "While this extremely localised and directed heating effect has been put to some good uses like targeting cancerous cells to kill them, we have been keen to find a way to get past the problems it causes, such as in biochemical analysis," said Dr Cortes. The discovery opens up the possibility for new equipment that can track individual biochemical reactions in over a period of time, allowing scientists to understand these processes in significantly more detail than at present, and without overheating.